In the words of the late, great songwriter, Theodora Morse, “Hail! Hail! The gang’s all here!” This week, let’s salute music and Remembrance Day. Up my sleeve, I have a few favorite patriotic music sheets, recently scored at the flea markets. We’ll also pay homage to the Tin Pan Alley music publishers, songwriters, and artists. So strike up the band! Don’t miss the Cathédrale Notre Dame’s great organ. Earlier this year, after an intensive and much needed 10-month supreme makeover, the organ kicked-off the festivities for the cathedral’s recent 850th anniversary. Music to my ears. Listen: All 8,000 pipes (some dating back to the 18th century) were individually cleaned, and a new electronic panel with five cascading keyboards and some 200 stops were installed. Boom. Boom. Boom. Can you hear me now? Calling Quasimodo! Meet your new bells: Jean-Marie, Maurice, Benoit-Joseph, Steven, Marcel, Dennis, Anne-Geneviève and Gabriel, along with six-ton Marie. Using medieval techniques, they were cast at the Cornille Havard Bell Foundry in Normandy. (Marie was made in the Netherlands.) As part of cathedral’s birthday fête, the shiny newbies replaced Napoleon’s 19th century bells: Angélique-Françoise, Antoinette-Charlotte, Hyacinthe-Jeanne and Denise-David. “Bells are like human beings. They live and, one day, they fade,” said one of the “campanologues” (bell experts) involved. Sunny side: The oldest Bourbon bell (13-ton Emmanuel) survived the French Revolution and the recent turnover. 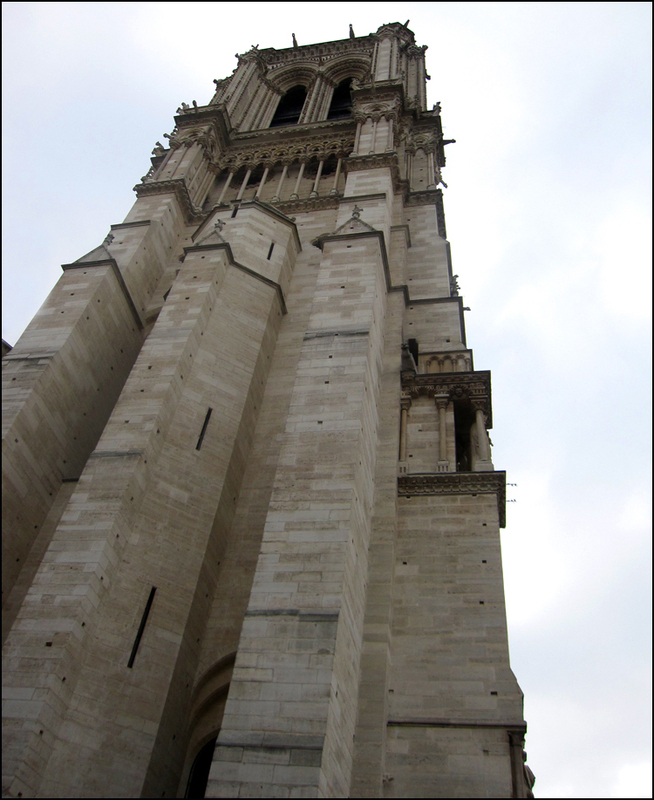 Without fail, since 1856, the bells of Notre Dame have rung every 15 minutes. They also rang to mark the end of World War I and the liberation of Paris in 1944. Clipping from The New York Times in 1875: The people in the abbeys, cities, towns, and hamlets loved their bells and listened to them on holidays, as people nowadays listen to an opera. They could understand the language of the bells in its many cadences; and when the clanging was heard as a war-alarm, they were stirred as with the sound of a trumpet, and could feel something like Victor Hugo’s Quasimodo, the Hunchback who falls into such a frenzy among the clanging monsters in the belfry of Notre Dame. Winding it back: During “La Grande Guerre” (a.k.a. 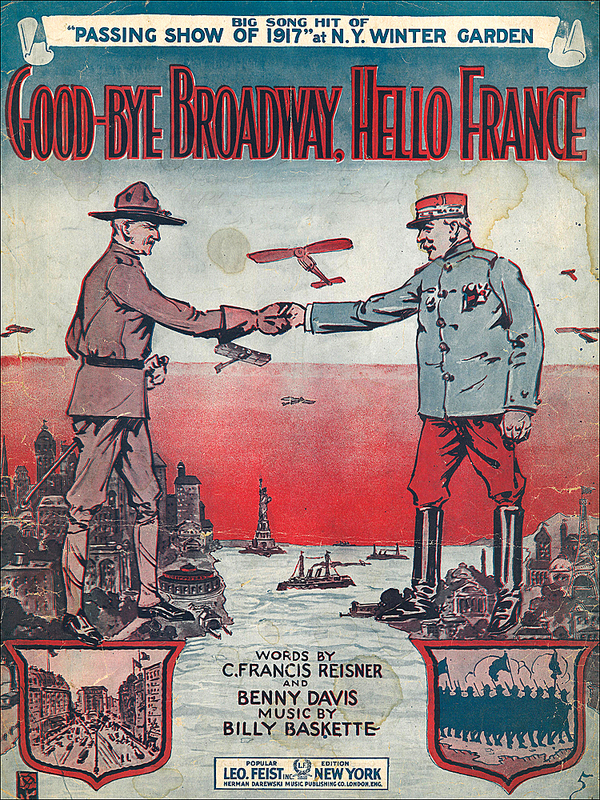 La Première Guerre Mondiale, or World War I), Feist published a pocket-sized “Songs the Soldiers and Sailors Sing” for the masses. At fifteen cents a pop, the 80-page collection was affordable, patriotic, and catchy. It included now-famous titles like “K-K-Katy,” “Over There,” and “Hail, Hail, the Gang’s All Here.” The booklets, along with individual song sheets, were sold in five-and-dimes and department stores. 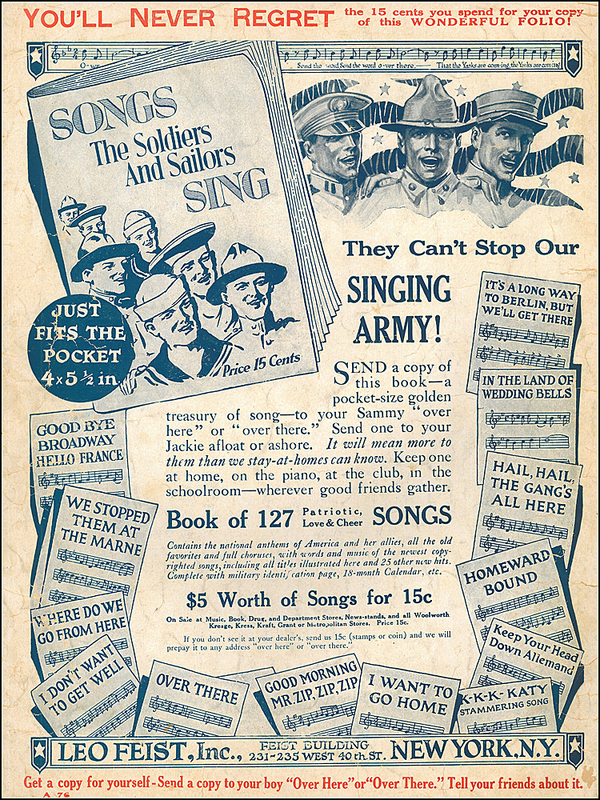 Folks were encouraged to sing the patriotic songs at home, in theaters, and at Liberty Bond rallies. 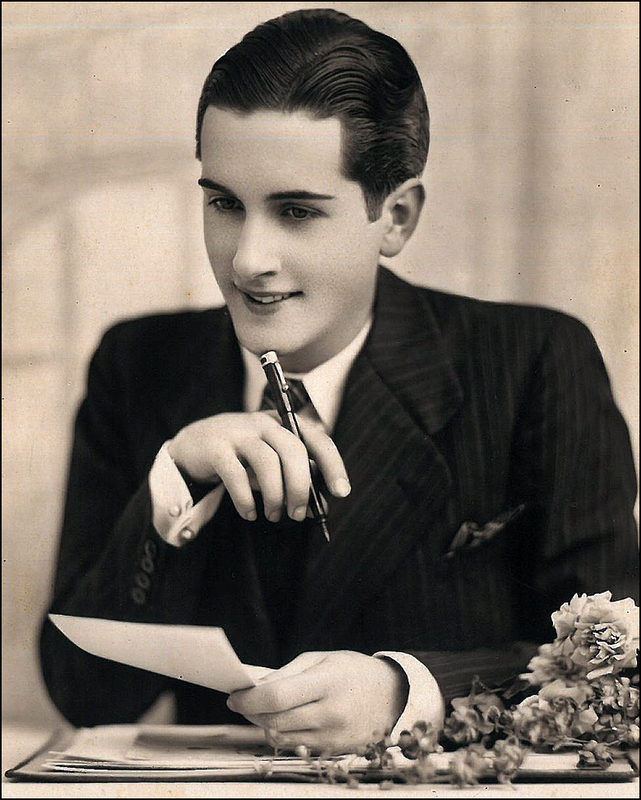 In full-page advertisements, Feist sounded his trumpet and bells like no other: Our boys on the fields of France, our sailors on the big, gray sea-fighters, and the boys in our training-camps are singing them! The whole country is singing them and dancing to their inspiring melodies! Being sung to tremendous applause in thousands of theatres throughout the land! Try over the choruses and you will know why. Don’t wait until you hear everybody singing them—get copies of all four of these songs now and be the first to sing them. They can’t stop our singing army! Interested in Notre Dame’s bells? Grab your cloche hat and follow this link to our chum Paris Paul Prescott’s “Paris by Cellphone” site! 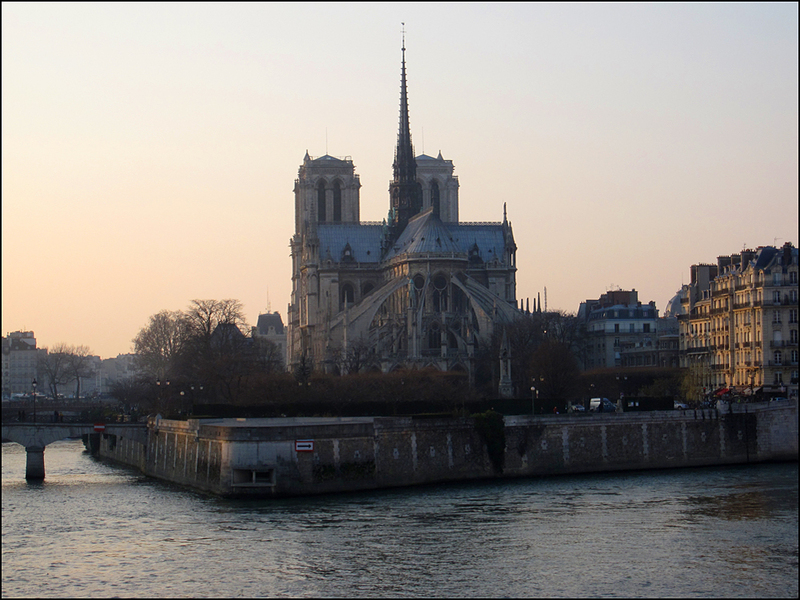 Then, stop by his new site: “Our Ladies: The Churches and Miracles of Paris.” Paul’s photographs are gorgeous! Virginia and I are hiding in the shadows of the flying buttresses with a bottle of champagne, giggling and our glasses clinking wildly as we listen to the new bells and watch Theadora dashing back and forth looking for those ruby slippers of Virginia! What fun ………..oh there she goes again…giggle…giggle…..giggle…..must take another sip……oooooo the bells so beautiful. Perhaps it is time to call out and have Theadora come sit with us, she does look like a glass of bubbly would do her good. Ring-a-ding-ding. It’s true. “I’m late! I’m late! For a very important date! No time to say “Bonjour, Bonjour!” I’m late, I’m late, I’m late!” is what I said to Quasimodo and Esmeralda. High and low, I looked for you and Virginia. I could hear the giggles and the singing, too, I do believe. And the wild clinking drove me quite mad. But now I’ve found you! And YES. I’d love a sip of bubbly, kind Tinny! T.
That is one wonderful post! I love seeing those old music sheets and advertisements. What a wonderful post you made! Last time I was in the area I stayed in a lovely hotel called The Muguet….the room was so small I had to sleep standing up. The Muguet! Is this the Muguet in the 7th arrondissement near the Eiffel Tower? What a cute hotel! YES. Great location. Hotels in Paris are usually very tiny. Did you enjoy your stay? T.
Those heartbreaking posters and your glorious shots of Notre Dame (that first one is dazzling!) but hats off to Quasimodo feeling affection for his bells returning!
. What a lovely night! Here’s another nod to our friend Quasimodo. I do love the names of the bells! “Go on! Go on, Gabrielle!” he said, “Pour all your music into the square. Today’s a feast day. Thibauld, don’t be lazy. You’re slowing down! Go, go on! Are you becoming rusty, loafer? That’s it. Quick! Quick! Don’t let the clapper be seen. Make them all deaf like me. That’s it, bravo! Thibauld! Guillaume! Guillaume! You’re the biggest, but Pasquier’s the smallest, and Pasquier swings better than you! Those who can hear, I’ll wager you, hear him better than you! Well done! 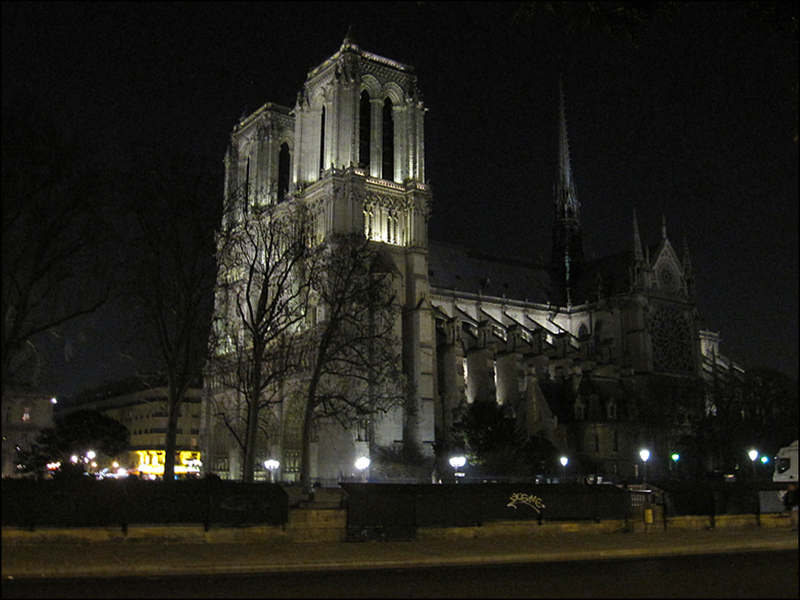 Too many decades ago when I did a student summer in Paris I lived in a foyer on Ile St. Louis and walked by Notre Dame every day on my way to classes at the Sorbonne You’ve just given me a memory shot– so lovely, thanks! Wish I could hear that organ. That’s a lot of years ago (41 I think).. I don’t really remember the bookshop but for some reason my main memories of the island are the foyer dining room (the French girls taught me how to splay open a piece of baguette and slather it with butter and jam (oh to be 20 and unafraid of fat and cholesterol…) and the walk by Notre Dame… And just how charming everything was on St. Louis. In some ways I think was too young to fully appreciate it. In that case you’d enjoy my post on the Whitechapel Bell Foundry (see http://londonunveiled.com/2012/08/14/bellfoundry/ ) – a to-do for your next trip to London. I thoroughly enjoyed your post about the Whitechapel Bell Foundry! I am adding it to my must-visit list! I also loved your photographs. Thanks for sharing the link. (I love the Whitechapel Art Gallery. Beautiful space. A few years ago, I got to see the “Inner Worlds Outside” exhibition. Wonderful. Wonderful. So one could very well visit both spots. The gallery is about a 3 minute walk from the bell foundry. Great Bell “Big Ben” first chimed in 1859. It took 18 hours to pull the 13 1/2-ton bell up to the Clock Tower’s belfry. Interesting! Thanks ringing in more bell tidbits! Ah, thank you, Kim! Have a lovely weekend! Ah, what a lovely passage!! Thank YOU. Have you seen the “Amelie” film (2001)? The film was shot in Abbesses. Throughout the film, the bells of Saint-Jean in Abbesses sing! It’s worth watching the film just for the sound of the bells! Oh Amelie is one of my favourite movies…..my name is Julie and I am a Paris addict!! A brilliant collection of photos, posters, words, feelings … classic Theadora! Thanks, Thea! I do enjoy the research. Sometimes it’s difficult to STOP and hit the “publish” button. I’m sure you’ve been there. You spend a great deal of time with your posts. I can tell! And YES. Theodora Morse! Theodora Morse was married to fellow songwriter, Theodore Morse. Funny, eh? They were one of the first Tin Pan Alley husband and wife team. Theodora also used the name: Dorothy Terriss. I’ll try to dig up more of her work. Again, merci! And enjoy the weekend! 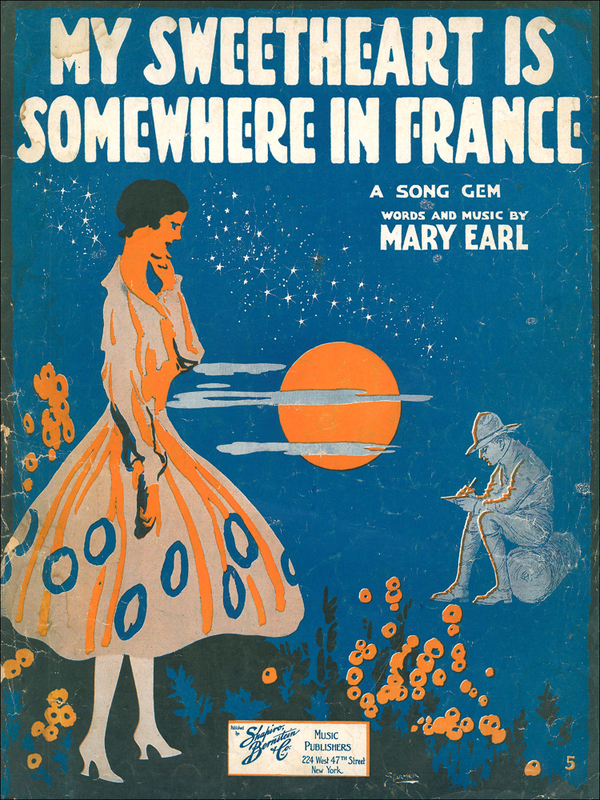 Such an amazing post and posters, Mary Earl’s Song gem is my favorite! 🙂 but I really love the all!! I also love the “My Sweetheart is Somewhere in France” sheet. The illustration is pretty darn wonderful. 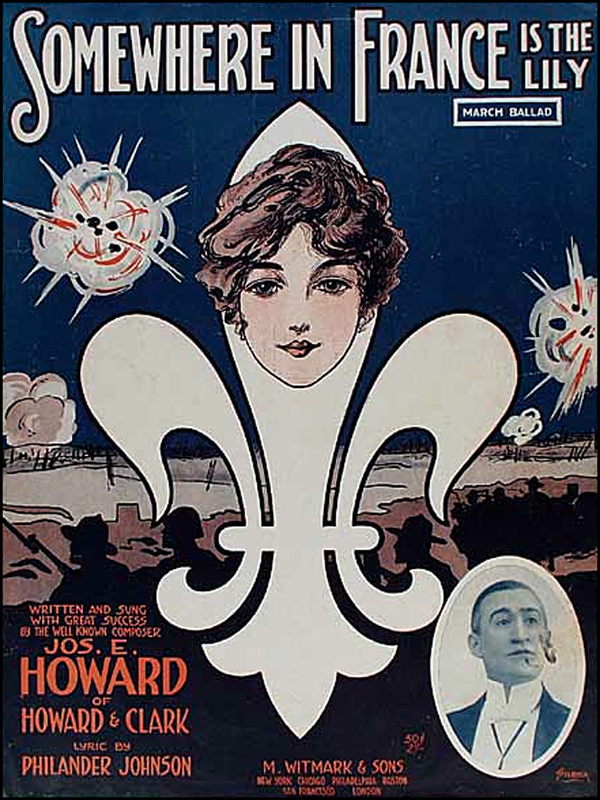 By the way, William Starmer and Frederick Starmer also created the cover of “Somewhere in France is the Lily.” Another beauty! Ah, thanks for the extra detail, I’m such a sucker for the words that contextualize the images!! Love your posts and the care in your responses!! Here’s another extra detail on Mary Earl: According to the Parlor Song Academy and Columbus Ohio’s Columbus Senior Musicians Hall of Fame, “Mary Earl” was a pen name for Robert “Bobo” King. For years, “Bobo” King worked with music publisher Leo Feist. Interesting. Tin Pan Alley was a small world. Also, thank you for always leaving such thoughtful words! And have a creative week. I’m already looking forward to curated collection of photographs. They inspire, I tell you! T.
Small world indeed!! Now that’s exactly why I still want journalists and journalism in my life. Some subjects require actual research effort and writing skill beyond a vapid-off-the-cuff-140-character opinion 🙂 Thank you!! A wonderful journey, as ever, magnificent original pictures: a perfect post dear Theadora 🙂 ~~~ et quelle ville! What beautiful graphic design – this style is surely due a resergence. Great photographs again, T! Love number three – it fits the Hugo quote very nicely. I wonder how many people sang Feist’s songs at home. Thanks, Richard! The music sheets illustrations are gorgeous! And large. Prior to 1918, they were 11 x 14 inches. 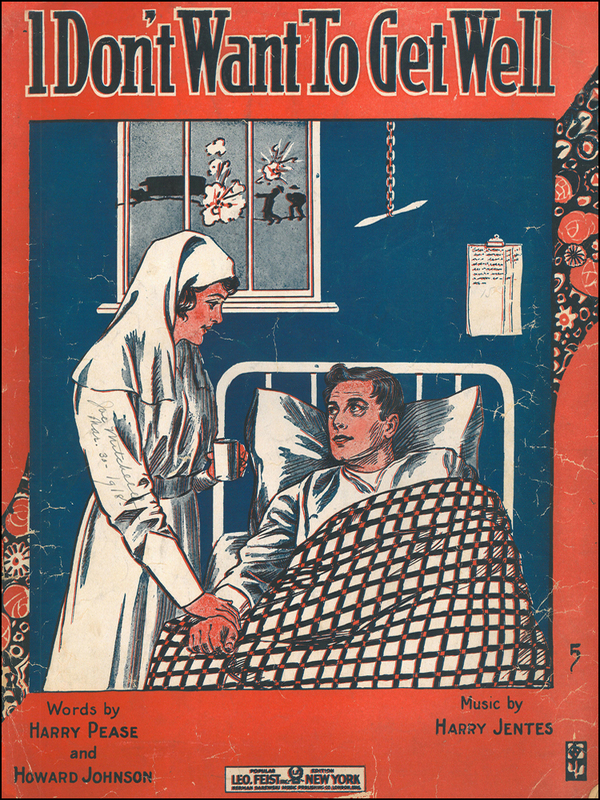 After WWI, they were reduced to 9 x 12 inches (probably to fit in the brand-spanking-new piano benches. During WWI, they were still using piano stools. At the time, pianos held court in the parlors! I’ve timed it Tin Man. Every fifteen minutes those glorious bells ring out , so if you are going to serenade Theadora and me you have to be quick off the mark. We’ll drink bubbly during the bells and then listen to your rendition of Goodbye Broadway Hello France. By the by, do you know Lily Marlane or How about The Caissons Go Rolling Along? YES. The bells ring every fifteen minutes, Monsieur Tin Man! Wonderful, wonderful choices, Virginia. What to sing? A love song or a marching song? Both have interesting backgrounds. I found the “The Caissons Go Rolling Along” lyrics. They think it was written in 1908 by Edmund L. Gruber, William Bryden, and Robert Danford and then published in 1921 by Shapiro, Bernstein & Co. And then it was rearranged in 1917 by John Philip Sousa. “The March King” wrote 136 marches. 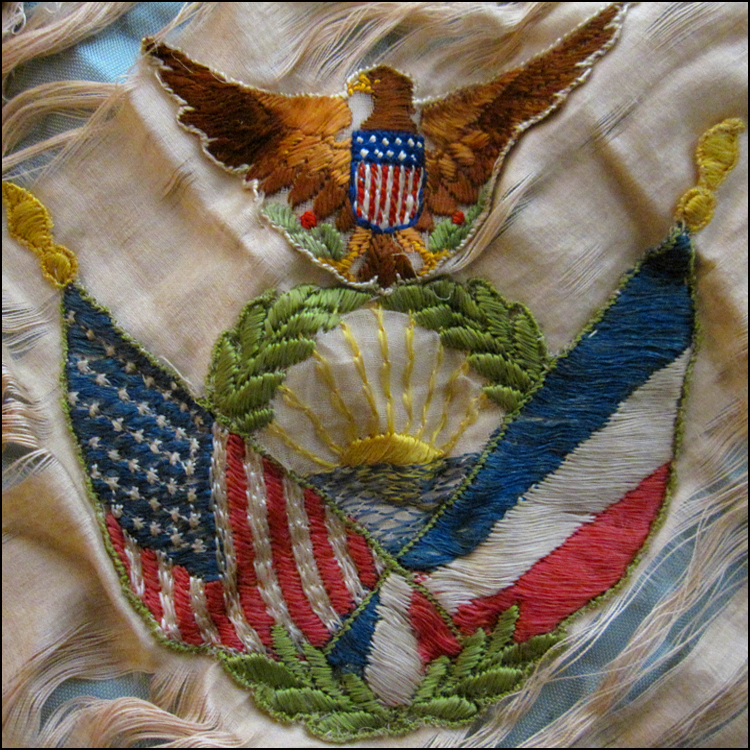 (Including the “Stars and Stripes Forever.”) He also wrote operettas! Interesting. Merci, Virginia! I listen to the scratchy recording by the most marvelous, delicious, Marlene Dietrich at least once a week. Of course my recording is in German……….oh, the three of use arm in arm walking the side streets of Paris in the evening fog……..delight! I toast you my darlings, Virginia and Theadora! Your posts stand out above the rest- always! and thanks for stopping by my “layers” this week and clicking that trusty “like” button. I’ve shared your post via Twitter and FB and an email to my friend the French professor. Merci, Ruth!! Thanks for helping me spread the word. I appreciate it. AND by the way, I LOVED your ab-fab “layers” shot. It caught my eye. It reminded me of candy! T.
Wonderful post and the illustrations are magnifique! What thoughtful words! I found the “Souvenir de France” pillow case cover at a little consignment shop in New York. It’s tattered. Torn. And well-loved. Then and now. 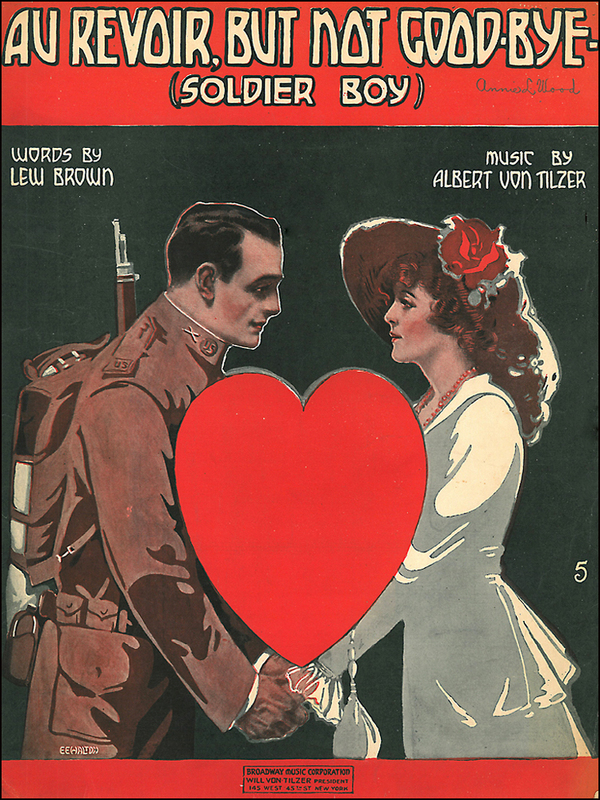 Wonderful – great sheet music – tells a whole story. Thank you!! Stay tuned for a Sheet Music Part II! The art is magnificent! Here’s a sampling of the titles: Irving Berlin’s “Call Me Up Some Rainy Afternoon,” Geo. Little and Art Sizemore’s “So Tired,” and Georges Auric and William Engvick’s Moulin Rouge hit “Where is Your Heart.” Oh, la la! T.
A wonderful memory… my father always sang Lili Marlene. As a child I leaned the words and sang along with him. Sweet story, Thom! I love it. Do you still have tune memorized? For inspiration, I’ve been spinning Marlene Dietrich’s version. T.
For a brief moment there, I thought you meant Edgar Allan Poe’s piece. I guess not! Hahaha! Love his work. Apt too for your post! Thanks, Thea. Always a great visit to drop by your blog. I walk away feeling very Parisienne! Ah, thanks! I agree! I’m also a Poe fanatic. When I lived in Baltimore, I’d often pay homage and visit his grave site and former digs on Amity Street! T.
Ahh, T, I always enjoy coming here and this time I reveled in the bell immersion. Love the sheet music, too. And since I had time to read through comments, I learned even more. I’ve been behind on reading posts but thought of you this morning, as I did one last farmers market post for the season today, so I scurried back through my emails so I could read your post. So glad I did!! Janet, I just spotted your Farmers Market Post! I loved the close-up shots of the autumn produce. Especially the top shot of the ruby red radishes! What kind of apples did you score? Beautiful photos and fun artwork. Great post, full of information beautifully put, that carried me onto the previous macabre but, somehow, romantic post. Thanks for such thoughtful words, as always! I appreciate it. It was an interesting post to create. Folks are still passionate about their bells. This year, the lines at Notre Dame were very long! T.
Good. Golly! Thanks for the kind words, along with the link to your photographs of the bells. What gorgeous portraits of the Notre Dame Bell Family. I also love the crowd shots. Lovely! Lovely! Quasimodo would have approved! I’m going to add your link to bottom of the story. Thanks so much, Paul! T.
Thank you so much for the link, T! It’s taken some time for me to extoll the brilliance of your “bells bells bells.” (Read: technical difficulties with various devices. Errr.) Was Fiest American or a Brit? I never stopped to think who wrote those songs. Your photos are always divine as well as your “flea market finds.” Are they the source of those spiffy album covers. I love that cover for “My Sweetheart is somewhere in France.”: The woman’s skirt reminds me of this killer Marimekko pattern from the 60s or 70s. I’m still trying to figure out why I love having every timbre, pitch and shape of bells surrounding me. I’d probably still wear them on my person if it didn’t drive the general public insane. YES. The skirt on the cover of the “My Sweetheart” does resemble a Marimekko pattern! Great eye! And ear. I loved, loved your bell stories. Of course, you would don bells in your ringlets! Another tiara! Imagine a tiara made of bells? Have you seen such a critter? And speaking of flea market finds, I just scored a very large 18th century portrait of a cat, wearing a bell. Belling the cat just got easier. The frame is incredible. I’ll post it soon. And speaking of bells, let’s not forget to mention the Marie Antoinette soundtrack. As you know, the sound of bells ringing kicks off the track. “Versailles Intro” is the title. It’s short. But a beauty! Heck, keep on wearing your bells! C’est vrai! It’s in the coronation scene–right after rather–as the royal pair descends those royal blue stairs with the fleur de lys pattern. Love the dress and the killer aigrette she’s rocking. Across the Bored has nominated you for a Versatile Blogger Award at http://acrossthebored.com/2013/11/26/two-cents-tuesday-challenge-writing-week-2/. If you choose to accept, feel free to pass it along to other deserving bloggers! If not, know that your blog is well appreciated and a source of inspiration for us. Ah, thank you for the gorgeous words! A shawl? I love it. And as you know, I also love your “Across the Bored” description: “Old enough to rant, too old to rave yet sufficiently young to forge a path into the future.” Perfection. Thank you for your inspiring shawls! T.
Hello Theadora…I just remembered this song because of one of the pics seen here…. There are so many interesting, funny things here that I don’t know what to say. 🙂 I had no idea that bells fade over time or that there were so many bells in Notre Dame. Amazing too that it’s been around for 850 years. The whole idea of a singing army makes me feel very nostalgic for that time period.